Check the bottom of this post for more information on the giveaways. Covering up her own murder was one thing, but faking life is much harder than Kaylee Cavanaugh expected. After weeks spent "recovering," she's back in school, fighting to stay visible to the human world, struggling to fit in with her friends and planning time alone with her new reaper boyfriend. The ending of If I Die marked a turning point in this series. What would happen after Kaylee’s death and reanimation was anyone’s guess, but saving souls from being stolen and sold on the hellion blackmarket definitely sounded like her kind of job. However, it was also clear that experiencing and remembering her own murder, killing her math teacher (no matter how evil he was), and the Afterlife would change her and her relationships with her friends, family, and boyfriend. Then there is, of course, the Tod-Kaylee-Nash-Sabine love-knot. And it is still… knotty. Nash is still furious about Kaylee framing him for murder. However, Tod and Kaylee’s relationship is absolutely beautiful. I love how they interact with one another, and I promise you scenes that will make you fan yourself with your bookmark and dry your eyes with your sleeves. The plot in this installment of the series unravels wonderfully and keeps you on the edge of your seat. It’s very very hard to put down. Also, I would not have thought it was possible to cram so much plot and drama and heartbreak into the last two dozen or so pages. 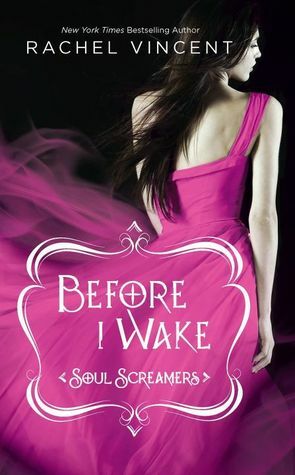 Kaylee’s trials in If I Die could never have prepared her for this, and I cannot wait to see how it all turns out in With All My Soul, the last novel in the series. I thought that If I Die was hard to top, but Rachel Vincent definitely did it with Before I Wake! *sigh* Kaylee and Tod… seriously one of my favorite couples ever. And all that without being mushy-gushy super-sweet! Because that kind of stuff makes me gag… but here it’s just sincere. It’s realistic. It’s bloody, and desperate, and tender, and perfect. Not to mention hot. I loved all the scenes of them together. Tod finds the perfect words. And I love the snark of course (also Sabine’s). And then Alec… oh god. I actually thought something was off. But there was no way Kaylee could have known. Still – she was the one who killed him, and I don’t know how she will ever deal with that… on another note, I really liked Avari’s speech about what he has planned for Kaylee. It was beautifully written, and I wouldn’t have expected such almost poetic thoughts from a hellion. While I had an inkling about Alec, I was completely caught by surprise when it comes to Emma. When she died, I just… it was too awful. I was so glad that she now lives on in Lydia, but I can’t imagine that she’ll be thrilled about having a different body, and having to share it (from what I understood anyway). Did Lydia’s siphon abilities survive and transfer to Emma? Now on to the giveaways! One entry per person. I will check the IP addresses and multiple entries will be deleted. You must be 13 or older. Since I am just starting out as a blogger, I require you to follow me in some way. I might make this optional in later giveaways. The BIW giveaway is INTERNATIONAL as long as The Book Depository ships to you. The IID giveaway is restricted to Europe, the US and Canada because I will have to ship this copy myself. I will contact the winners by email. If they do not respond within 48 hours, I will pick a new winner. I haven't read any book in this series ;_; So... Sad. Can't wait to read her works. This is an excellent series! I haven't started the series but it looks super super good! I loved it. It was the best one so far an it left me speechless. It was beautiful,sad, nerve wrecking and simply amazing. I cant wait for With all my soul. I've only started this series but it's great so far. This series started out only ok but now I'm completely in love with it! The books just keep getting better and better :) Ever since My Soul To Keep, in my opinion. I am very excited to read this book. It sounds so good. I love Rachael Vincents books. I haven't read BIW yet, but it's in my stack of library books that I'm working my way through! I haven't read these yet, but I want to! I havent read this book yet but the series sounds amazing! Thanks for the giveaway! Haven't read this series, but definitely want to! I haven't read this particular series but I do love Rachel Vincent and have been being to pick up these books for a while. I'm reading Before I Wake now and I absolutely love it. Tod is yummy! I haven't heard of this series. It looks good....I think I'll need to pick it up!